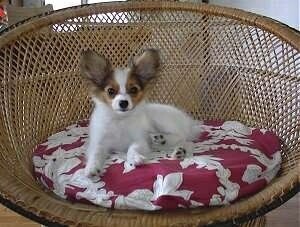 The Papillon is sometimes called the butterfly dog, because the ears look like butterfly wings. It is a friendly, intelligent dog that is tougher than it looks, and loves outdoor exercise. It is a playful, lively, amusing, animated and charming little dog. Affectionate, gentle, patient, and proud, it loves to cuddle and enjoys a good romp outdoors. They are steady, obedient and are not yappers. Papillons can be trained to perform small tricks. Good with cats when they are socialized with them. They can also be difficult to housebreak, but are, in general, easy to train otherwise. If you allow this dog to become pack leader to humans, it may become very possessive of its owner and resent outsiders. When a dog believes he is pack leader to humans, it is called Small Dog Syndrome, human induced behaviors, where the dog is allowed to believe he owns the house. This can cause a varying degree of behavior problems such as, but not limited to, being nervous, high-strung, timid, separation anxiety, guarding, growling, snapping, biting, obsessive barking, dog aggression and being untrustworthy with children. These are not Papillon traits, but rather behaviors brought on by the way humans are treating the dog. 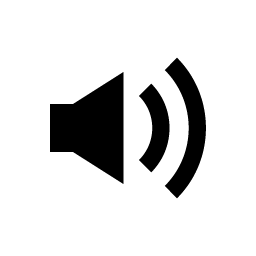 Since most people who own small dogs, because of their size, unknowingly allow them to run the show, they are not generally recommended for young children. However, if you are your dog's firm, consistent pack leader, providing rules he must follow and limits to what he is and is not allowed to do, along with daily pack walks, the Papillon can be very trustworthy with children. They will be calm if sufficiently exercised. Sometimes prone to problems with the kneecaps (patella) in the hind legs, this can sometimes be corrected by surgery. Also fontanel (an opening at the top of the skull similar to a baby human's "soft spot"). It sometimes corrects itself but if it does not, the dog needs to be protected. Some have a difficult time under anesthesia. The Papillon is one of the oldest breeds of dog, with a recorded history in Europe going back nearly 700 years. The breed originally only had dropped ears and was called the "epagneul nain" or "dwarf spaniel." Much of the breed's development is known because of its depiction in paintings. This tiny breed is recognizable in 13th through 15th century Italian paintings in the Renaissance period. They were often painted on the laps of French and Spanish noblewomen. The dog was later known as the Continental Toy Spaniel, which is the official name the FCI standard goes by. They were sometimes referred to as simply a Toy Spaniel. Over time, an erect-eared type, fringed as to resemble the ears of a butterfly, developed. Papillon means "butterfly" in French. The AKC calls the breed a Papillon, with Phalene being the name for the drop-eared variety, whereas the FCI calls the breed a Continental Toy Spaniel with two varieties: Papillon for the erect-eared dogs and Phalene for the drop-eared dogs. In the United States and according to the AKC standard, Papillons (erect-eared) and Phalenes (drop-eared) can be born in the same litter and are shown together as one breed. 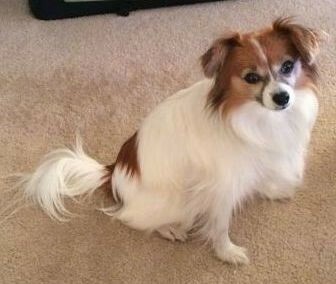 While the AKC allows for the Papillon and Phalene to mix mate, the FCI strictly prohibits mix mating because of problems with the position of the ears. One FCI breeder states, "When a Papillon and Phalene are mixed, most of the time incorrect ears on both varieties are the result, i.e. one ear erected one dropped or both bended on top or a different combination of the mentioned problems. The correct position of Phalene ears is to lie close to the side of the head showing no gap, but when you mix the two the ears they do show a gap which is called "open ears". If there are the opposite genes in either variety incorrect ears will always show up in the litters." Because of the tail’s long fringing and the way it is carried curled over the back the Papillon was once called a "Squirrel Spaniel." 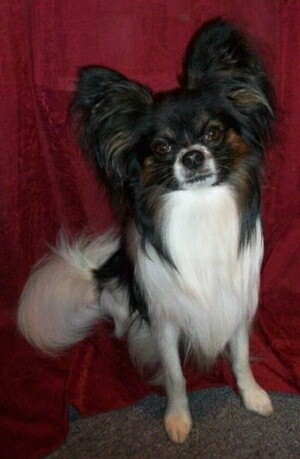 The Papillon was first recognized by the AKC in 1915. Some of its talents include: watchdog, agility, competitive obedience, and performing tricks. 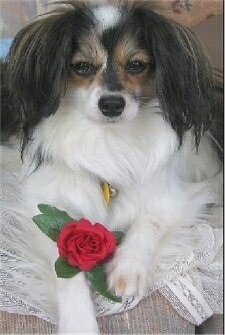 "Leia, as in Princess Leia, is a 10-year-old white and red sable Papillon. Leia is approximately 11 inches and weighs 15 LBS. Leia, a rescue, initially came from Petland. 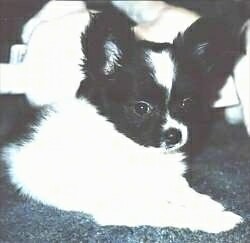 Leia is the product of a puppy mill, her ears are half-erect or tipped over aka a weak eared Papillon." 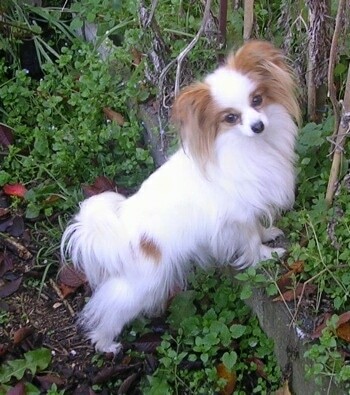 "Ruby the Papillon is very small, weighs only 4 pounds (1.98 kg.). She is an ex-show dog and is shown here at 6 years old. She has won Best in Show several times. She loves investigating outdoors and then reclining on her pink chair. I enjoy watching The Dog Whisperer and have learned a lot. Also tried some of his techniques with good success." "This is Lotta, a FCI Papillon from Iceland. She is a one-year-old show dog and has done great in shows here in Iceland despite her young age. She is a happy little dog. She loves playing outside in our big yard and she loves going on long walks. She is a strong little dog and has even gone with us on a 7-hour-long hike/walk which was no problem for her. Lotta is an active dog but she is well balanced so she is also calm and quiet. She loves her "big sister," which is a Golden Retriever / Labrador mix, very much and they are great together. Lotta loves everybody and isn't shy with people at all. She is a stubborn and a strong-minded little lady but she knows we are her leaders. Lotta loves playing but she also loves to cuddle with her owners. Lotta proves that little dogs CAN be just as efficient, obedient and playful as any other larger dog. Lotta is a balanced dog, since she gets enough exercise, discipline and of course also a lot of affection. I have watched the Dog Whisperer and those shows taught me a lot about how the dog mind works and how me and my family have to make sure our dogs understand we are their leaders." 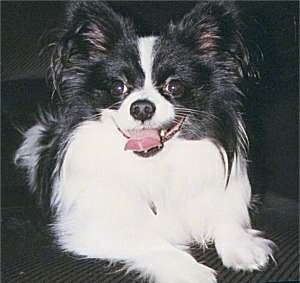 "Abiding Grace (black and white) and Sweet Hope are full-blooded, AKC-registered Papillons. Grace is 6 months old and Hope is 2.5 years. 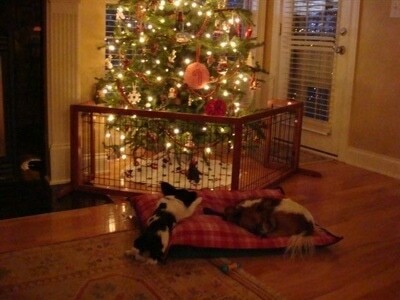 Both are puppies of Happy and Giget who live in Lacy Spring, AL. Papillons are very different from any dogs I have ever owned. Their temperaments are stable and they are absolutely devoted to 'their people.' Hope belonged to us as my husband was battling terminal cancer. She never left his side until the day he died. They are, however, very headstrong and need to be guided with a firm but fair hand. I have used the Dog Whisperer and read Milan's book Cesar's Way. What I use the most the idea that I am in charge and as such will not be intimidated or bullied. I have taught Hope and am training Grace that I go out first which really does put me in the alpha position. Dogs are dogs, not people." This is Indy a.k.a. Westway Indian Outlaw at 12 weeks.